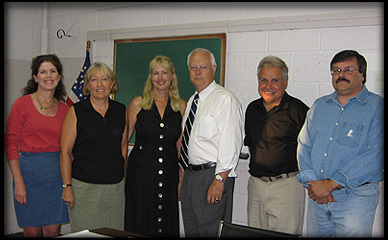 On Wednesday evening, August 17, 2005, Congressman Don Sherwood announced the award of an $8,000 grant to Clifford Township from the North East Pennsylvania Urban and Community Forestry Program. The Clifford Township Bicentennial Tree Assessment and Planting Project Grant, combined with a match of in-kind donations and cash, will provide funding to Clifford Township to join forces with the Clifford Township Community Alliance (CTCA), the Mountain View Garden Club and community volunteers to assess the trees and planting sites of the villages, crossroads, Township Building & Recreational Center and gateways to the township. In the photo from left to right are: Meg Suraci, Mountain View Garden Club; Lynn Conrad, NE PA Urban & Community Forestry Program; Cherie Swetter, Clifford Township Community Alliance (CTCA), Congressman Don Sherwood; Jim Pettinato, CTCA; and Chris Marcho, CTCA. 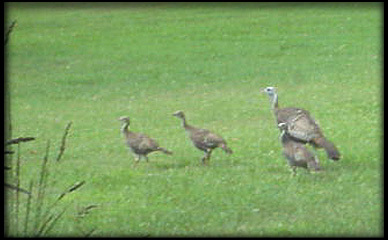 Mother Turkey Hen and brood on a morning visit.